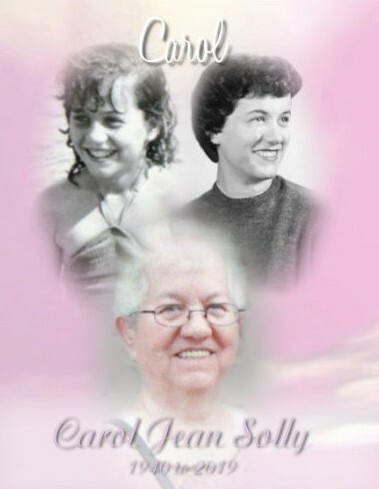 Carol Jean Solly was born on January 25, 1940 to parents, Donald & Dorothy Crawford. She earned her angel wings on Saturday, April 13, 2019 to once again be with the love of her life, Thomas Solly, whom she married September of 1958. Carol was preceded in death by loving husband, Thomas Solly, her parents, Donald & Dorothy Crawford, and brothers Donald Crawford Jr and Richard Crawford. Carol is survived by her children, Douglas (Lyn) Solly, Lori (Randy) Norris, and Sheila (William) Earp, eight grandchildren, and 6 great grandchildren. Carol always put her family first, she loved hosting holidays at her home. She also enjoyed working in her yard, she was proud of her beautiful flower beds. She found great joy in shopping. Sometimes Carol would get “lost” in the aisles, so she wouldn’t have to leave the store. Aside from family and friends, a close second on Carol’s list of favorites was chocolate cake. Visitation for Carol with be at Reeb Funeral Home, Sylvania, Saturday April 20, 2019, 9-11:00 A.M. where the funeral services will follow at 11:00 A.M. Interment Toledo Memorial Park. The family would like to give special thanks to Hospice of Northwest Ohio for their exceptional care in helping Carol on her final journey.